James (surname: "Wylds") was born in the June quarter 1887, at 28 Gun Street, Ancoats, Manchester, the eldest son of Matthew (Brush Dresser) and Sarah Anne (née Kerrigan) Wilds (1891 Census RG 12/3230). He had an older sister, Mary Anne, and four younger brothers and sisters, Matthew, Elizabeth, John Michael and Edward, and in 1901 (Census RG 13/3740) the family were still living at 28 Gun Street, Ancoats. 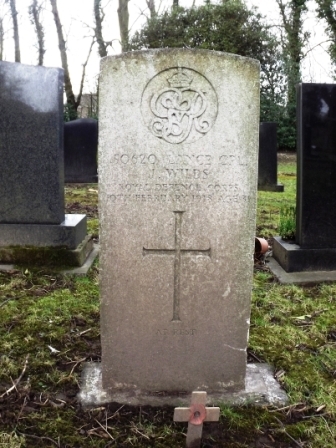 His enlistment papers also name his wife as Elizabeth Wilds (née Carr), but this was subsequently crossed through and endorsed "Deceased 28th November 1915". The date of their marriage was given as 13th July 1907 at St Ann's Church, Manchester. Two children are also named, James Francis, born 30th April 1908, and Matthew, born 30th March 1912 - but also endorsed 'Deceased 18-7-15". In 1911 (Census RG 14/24101) they were living at 7 Back Lloyd Street, Woodward Sreet, Ancoats, Manchester. On enlistment in June 1915 James gave his address as 119 Silk Street, Oldham Road, Manchester. He stood 5 ft. 7¼ ins. [1.71 m.] tall and weighed 8 st. 7 lbs. [54 kgs.]. Elizabeth's death probably accounts for why, five months later, on his second enlistment, his stated address had changed to 19 Cannary Street, Ancoats, Manchester. On both occasions he gave his occupation as 'Carter'. James first tried to enlist (Service No. 9885, The Black Watch) on the 24th June 1915, at Edinburgh, but after posting to the Depot he was discharged after 4 days as: "Not being likely to become an efficient soldier." He also suffered from bad varicose veins in his left leg. Undaunted, James travelled South to enlist at Lancaster on the 9th November 1915, aged 29 yrs. 9 mths., as Private 21497 King's Own (Royal Lancaster Regiment). His Service Papers list 6 years previous service with the 3rd Battalion, The Manchester Regiment, ending on the 9th March 1910. On the 11th November 1915 James was posted to the 10th Battalion, Royal Lancaster Regiment, but he was assessed as: "Fit for Home Service only. General condition below par." On the 29th April 1916 he was transferred to the Royal Defence Corps, joining the 10th Battalion (2nd (Home Service) Garrison Battalion Yorkshire Regiment)on the 18th August. The following January (16th) he was posted to the 4th Battalion (2nd (Home Service) Garrison Battalion Lincolnshire Regiment). James spent 37 days in the 3rd Northern General Hospital, Sheffield, in February/March 1917, suffering from Piles. However, he was appointed Lance Corporal on the 16th October 1917. 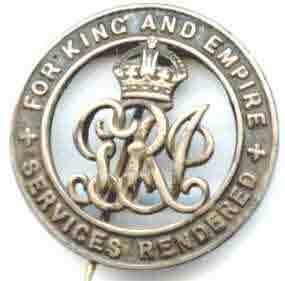 The Royal Defence Corps was a corps of the British Army formed in August 1917. It was initially formed by converting the (Home Service) Garrison battalions of line infantry regiments. Garrison battalions were composed of soldiers either too old or medically unfit for active front-line service; the Home Service status indicated they were unable to be transferred overseas. Eighteen battalions were converted in this way. camps. The regiment was never intended to be employed on overseas service. finally discharged on the 16th October 1917, "K.R. 392 XVI - 'Sick'. No overseas service". earlier last year  - see photo right.